I have many happy childhood memories of this season: riding the Queen streetcar downtown to see the decorations in the Simpson's window; throwing up in the street car; having a panic attack on the escalator. I was convinced I was small enough to fall down the slats. Yes, I was very young at the time. 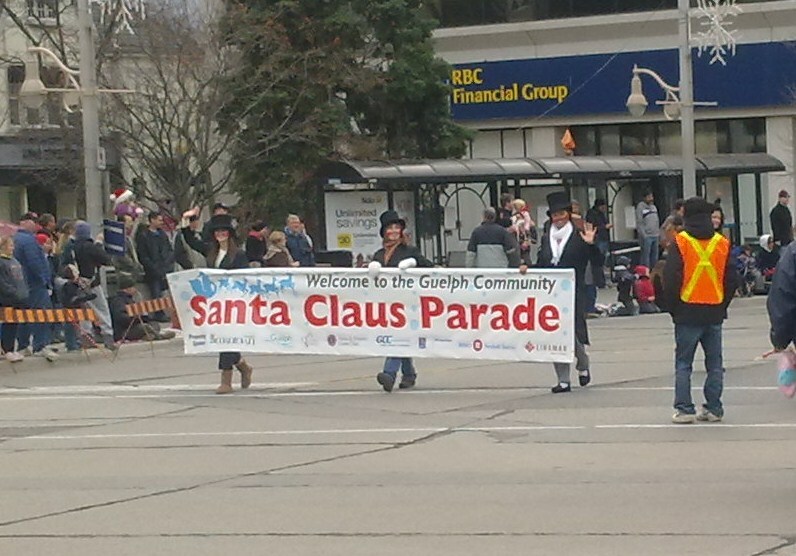 Is it any wonder we always watched the Santa Claus Parade on TV? My mother could only handle so much excitement. I didn't watch many parades, but I did march in them. I felt the cold wind blow up my kilt marching with the high school band. I played string bass in the concert band, which meant I got to play cymbals in marching band. With the bass drum, the cymbal players kept the beat. To this day I start walking in step when I hear the beat and I anticipate the music when I hear the snares go "ratta-tat, ratta-tat" followed by "clash-clash-clash". 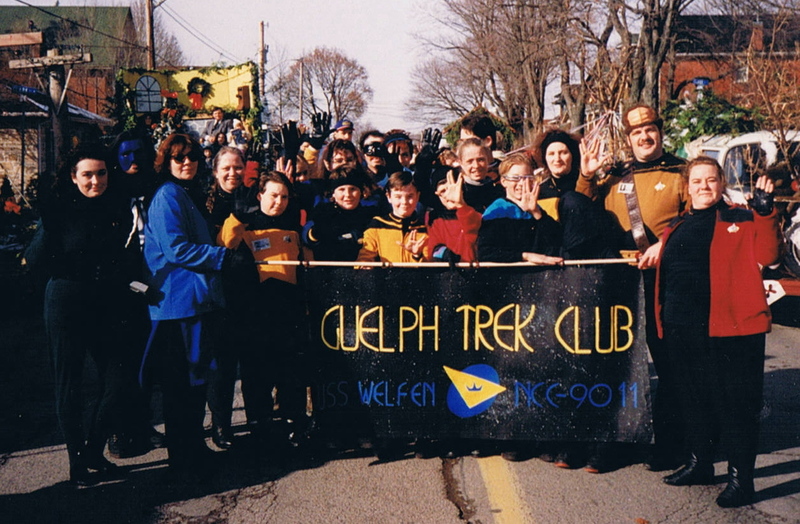 Later I marched in the Guelph Santa Claus parade in a completely different uniform (that's me on the far right) as Captain Bruce of the USS Welfen. The parade finished up close to home, so my roommate (far left) and I would have the gang back for chili and mulled cider after the parade. Those times bring back many happy memories and a little residual gas. It wasn't until my son joined cadets that I actually watched a parade from the sidelines. Remembrance Day Parade, Santa Claus Parade, Battle of the Atlantic Memorial Parade (he's a Navy League Cadet) and even the Fergus Highland Games Parade one year. Now Sam is in the Sea Cadet band. He plays the mellophone, not cymbals, and wears pants, not a kilt, but I feel a circle has been closed. 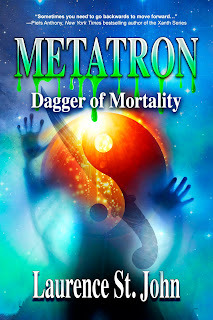 I still feel the beat (left, left, left-right-left) and still get that thrill of anticipation (ratta-tat, ratta-tat, clash-clash-clash). What can I say? I love a parade. I love parades too! My Dad always teared up whenever he watched one. 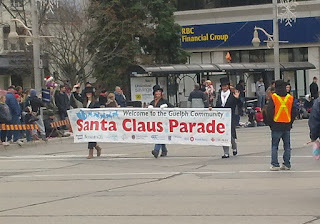 I remember a Santa Claus parade in Brampton in which my sister was a baton twirler. We were so embarrassed by the tears flowing down his cheeks. But oh, to be able to kiss those cheeks today!